How to Score Full Marks in English Class 12 Board Exam? 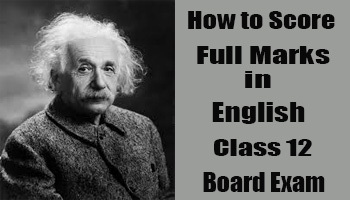 So here you will find so many tips regarding How to Score Full Marks in English Class 12 Board Exam means by following which you can surely achieve the same. Therefore, patiently read this article till the end otherwise no benefit. Before starting further really thanks for choosing this article and making you assure 100% that you will get golden tips from here so just leave all worries behind. It is good to make a time-table but generally, it is really harder to follow it because of many factors like occasions, ailments etc. that you have to face. So I mean it is natural and a part of life. Therefore, you should not get demotivated because of these hurdles. Now, you have choices to follow a time-table or how you should follow it. Before explaining further, let me tell you that what mistake we commit while making a time-table. We generally think that by dividing time on a daily basis along subject wise is the best way to make a time-table which is a totally wrong way to make an effective time-table. Instead, you should make a time-table on the target basis that you have to finish a particular subject within a specific timing. If you have ten chapters in your English subject then instead of making a time-table that just includes like I will study English daily for an hour make a time table that I will finish very first chapter within two days. Always do a target basis study instead of time spending basis study. Now, here remember one thing that sometimes because of many factors like you have to attend some kind of occasions like any festival or any family celebration ( Birthday/wedding etc.). So never be too strict because nothing is rigid in nature also. Therefore, be flexible means you have a life so live it, just attend these occasions and enjoy there then again come back and start following your time-table. That’s it. I hope you got the point. So this is one of the main factors that is the answer to the question i.e. How to Score Full Marks in English Class 12 Board Exam? Since hard-working is not the right approach means you must be smart also. Believe me, if you are studying same like pulling a rickshaw then it is not going to work for you at all means if you really want to know How to Score Full Marks in English Class 12 Board Exam then you must follow below tips. I mean to say that you must purchase a book that containing a last 5-10 years question papers so from here you can get a rough idea about the topics or questions from a specific chapter that where you have to stress more and where not. So make your strategy like following this smart strategy otherwise forget scoring higher in the examinations. Scoring is very easy then gathering deep knowledge for a particular subject. In my class 10, I was too weak in IT subject because I hardly went into the computer lab for practicals. So I smartly prepare a day before the exam only means I studied only the most asked questions chapter wise just a night before the exam and I got 87% in that subject and that was really surprising for me. I think you got my point. It means I do not have much practical knowledge in above mention subject during those days but smartly I managed to score higher in that subject. Note:- Here, do not misuse this example means it is far better if you prepare before or start preparing from the first day your class because if you do so then you having more information/knowledge for that particular subject that is not possible to gain in a single day. Scoring is too different than gathering knowledge. Although, it is also true that if you have knowledge then you can also score but who do not have too much knowledge he/she can also score higher it is also a universal fact. Remember one thing that you and your classmates means all are similar to a copy checker means he/she does not know you are a topper or whatever in the class. Only he knows that he/she has a copy of you in his/her hand. That’s it. So never get disappointed just give your full attention to the exam. Remember you always have two choices means do anything with a dull mindset or try to do that with a joy mindset. I always choose the second option because if we have to do a particular work then why not do it with a joyful mindset. And it is very necessary to answer the question How to Score Full Marks in English Class 12 Board Exam? It is really a foolish one that if you or any other person (Teacher/Friend/Family Member/Relative etc.) compare you with others because everyone has some qualities that may be different from others or may be similar. Sometimes we do not believe but we having very great qualities and unfortunately, we do not believe in us or do not aware about these. You may already know about the great scientist Albert Einstein who has developed the theory of relatively. He is totally dull in other subjects and got failed in many but he is a bullet in Physics. None can beat him in this subject. Imagine if we compare him with us that we are good in a subject of Accounts and he does not know anything about accounts then think about it means we are totally wrong. So never compare. Please, it does not mean you start studying only one subject means you need to study all the subjects to score and it is your duty/responsibility to do so. You may be a pure bullet in some field if you are a topper then you have hard working weapon sprit if not then you are more creative than toppers because you have a very flexible mindset. It is a reality you believe or not. Note:- It does not mean that toppers are not creative enough even but usually they use their mind in a straight line and you have an exposure of many things. Now imagine the condition if somebody says you that you have to hold a sword this way then you can fight with the enemy this way means by just using the words. Then send you to the real war then what going to happen means surely you are going to lose your life. I mean to say that if you have to give an exam so it is far better if you give at-least one exam as a trial yourself means take previous year question paper and try to solve it within the specific given time so that you will have a rough idea about how much speed you have to maintain during giving the real exam. Because it is a common problem that our some question left to be answered while giving the real examination and even we know the answers for the same. Therefore, it is really necessary to give a trial exam before giving a real exam. Must follow these to solve the problem that is How to Score Full Marks in English Class 12 Board Exam? Your examiner/copy checker do not know about you means he does not know you are a topper or not so let all the worries behind and keep following all these tips. Show your guts and 100% you are going to rock in coming examinations. Because when you give an internal examination then teachers have an image of you that also affects your marks but not in the case of board examination as copy checker know nothing about you. So chill. We are a pure example of habitual spices means we repeatedly do the things that we often do so it is natural. Therefore, never stuck get up again start following again until it will become your habit. Fall then get up, fall then get up and so on…………….habit is made. So simple trick. We are what we repeatedly do, so what you want to be, just start doing that regularly or periodically. Got it. Like I have already told you that instead of making a time table pertaining to the spending of time just make a rule to complete a task in the available 24 hours and it does not matter what time you do it but it matter you must do that within this timing range. Some of us stuck that we will get up at 4/5 Am then we do this but as I already told you to be flexible in life means you can not follow it just do it when you want to do. Make the things simpler not harder. But it far better if you get up early at dawn and do the same thing because of many factors like there is no disturbance at the time so your concentration is higher automatically at that time. Plus you have more time than others who going to get up later than you. Always remember that never left copy pages empty means it is a kind of psychological strategy that going to affect the mindset of the copy checker/examiner. This is the main reason behind the scoring in the subjective kind of examinations that sometimes you got surprised to know about some students means even they do not study too much but score higher because they never left the copy pages empty. While doing any work we have a graph of emotions that fluctuates too much means we can not be of the same attitude always so it is natural that sometimes we have an attitude and some time not. It is a natural process do not think about it and never get disappointed as it is natural just keep moving ahead with the feeling. Because it is a stupidity thinking about a sea without the waves. If you really want to score full marks then always remember there is no shortcut to getting this success. You need to apply really the great efforts for the same. Just pick up last 5-10 years question papers and solve them every weekend within the specific time limit and show the same to your teacher and ask the things that you need to improve. This way keep updating yourself until you will become an expert into it. As we already know that time is precious to us so it is one of the most important factors that is everything in the examination hall. Pre-plan your timing and be strict on it so that no question will be left unanswered. Like your paper is of 3 hours having three sections say A, B, and C.
It means you have 180 minutes and 100 marks you have to achieve. 1 mark= 180/100= 1.8 minute. Section A having 5 questions that you have to attend only 4 from these and let each carry 3 marks. As you already 1 mark= 1.8 minutes. so, 12 marks = 1.8×12= 21.6 ( 20 minutes you can say). So this way after considering last year question paper blueprint make it or plan it before and during examination follow the same timing. This way repeat some question papers at home too before giving the real examination. How do you find this article on How to Score Full Marks in English Class 12 Board Exam? Kindly let me know in the comment box that is available at the end. Same way do paper filing management means ask your teacher or seniors about the number of pages of real examination answer copy. You have 30 pages(15 papers) copy and 100 marks question paper. 1 paper= 100/30= 3.34 marks. It means you have to fill full 1 paper (or both side of a paper i.e. 2 pages) for a 3 marks question. This way plan your full paper. This is called smart work. Use black pen for headings etc. Try to write in points i.e. readability should be good. Make proper figures/diagrams where it is necessary. Give examples while answering a concept. Never left any question to be unanswered means try to write relevant matter but never left it empty. Take proper breakfast as it helps in boosting your memory and confidence too. Revise your own notes that you have prepared before. Check the essential things that you must carry with you that is further mentioned below. Watch – for time management purpose. It is natural to have fear of the examination as you are a human being so it is not an unreal thing. You have to think in mind while answering so practice the same while doing practice for preparing for the examination. Means do the real thing that you have to face means never try to skip these steps. We have made these categories which are not right at all. You may be bullet or cheetah in a particular field but not the same in other fields. Albert Einstein, forget-full of things but as you know superhero in Physics. Do not be foolish and never listen to the people who compare you with others. You also good in something you may know it or not but it is the reality. Keep this beautiful saying in your soul really it is very true and we can not run away from the things we have to fact the things anyhow. So face the things never run away because you have to face it if you run today then you have to face it tomorrow. Hence, there is no benefit to running away. Otherwise, you can not solve this puzzle i.e. How to Score Full Marks in English Class 12 Board Exam? Keep following all the mention steps. Remember one thing in life you have huge examples in life that you have lots of opportunities in life that you can utilize. Life in itself the biggest examination so you can not define it with just scoring in school/college subjects. Let me give you a figure. Around 95% of the world’s total wealth belongs to the around 6% of the world’s total population. A survey is done on the world’s top 1500 people in which around 96% found not the toppers at their schools. It is amazing to know. I hope you got the points. It shows that life is full of opportunities just open your mind. Note:- Here never misconception, I mean not to demotivate you, if you are scoring higher then it is greatest and if not then it is not the end at least you got the experience that we should not do these mistakes that further can lead to low scoring. Therefore, there is no failure in life. Failure means you got the experience that you can utilize later and also help others. Therefore, failures are also must in life. Because of failure we able to taste the success otherwise no feelings for the same. I hope you got my point. Have a great time ahead. Hence, these were the strategies or tips that you have just studies regarding the article How to Score Full Marks in English Class 12 Board Exam so follow these at will. Also, see: What is the real importance of English speaking for students? Must take last 5-10 year question papers and practice from these. Keep revising the done work periodically. Time table should be target oriented instead of time spend oriented. Must carry watch along with you in the examination hall. Life is full of opportunities so scoring is just numerical marks on a sheet. Better presentation always attracts the examiner/copy checker. Never leave a single page unwritten. Give more stress to more scoring topics rather than pulling a rickshaw. I think this article on How to Score Full Marks in English Class 12 Board Exam will going to help you a lot. Well! Huge thanks for reading this till the end. Please comment below and tell me, do you find it helpful? During comment just leave website tab empty if you not having any website. Kindly share it with the needy ones & help other students. This information is very great because every student wants to score high marks in the examinations and even many students able to score full marks i.e. 100/100 in the board exams. Nice explanation. Keep posting such a nice and helpful post.